More than one million tourists a year visit Izushi for sightseeing, looking for “castle town streets” and eating “Izushi plate soba”. The main attraction of Izushi is soba noodle served on small plates of Izushi white porcelain. 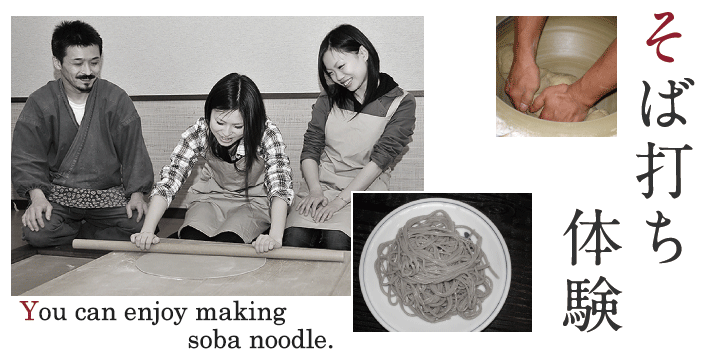 Now you can enjoy experiencing making the soba noodle at a workshop. You will be able to taste soba noodle you have just made. Group discount is available for a group of two or more. Limit on the number of participants A group of ten or more who made reservation. Limit on the number of participants From two to forty people. Limit on the number of participants Up to 40 people.